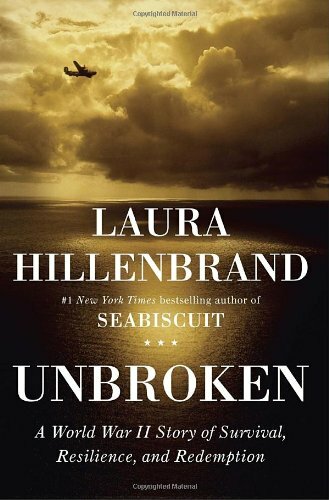 From the this last library came Unbroken by Laura Hillenbrand, the book on which was based the current film of the same name. For any who haven’t already heard, it’s about Olympic runner Louis Zamperini, whose B-24 bomber went down in the Pacific during WWII, leading to 40+ days on a small raft, followed by nearly two years in Japanese POW camps. He was beaten, starved and tortured before the war ended and he was freed. It’s a fascinating but at times grim story. I thought the post war section went on too long, but that was the author’s choice. Having read the book, I have no need to see the movie, though it might be interesting to compare them. I only read three short stories this last week, two from Lights In the Deep by Brad Torgerson, one from Robots and Magic by Lester Del Rey. The Inspector Banks novel by Peter Robinson that I was expecting from the library didn’t materialize, so I’ve started an SF novel instead. 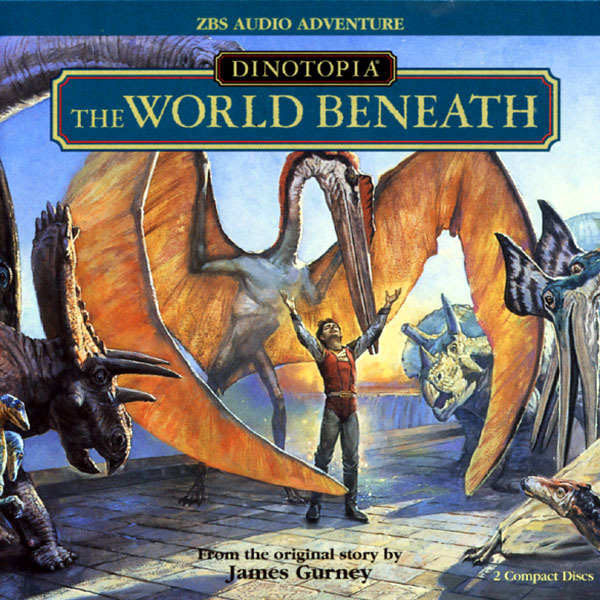 I also listened to a couple of audiobooks, really two sets of podcasts, Dinotopia and The World Beneath, both available from ZBS Foundation. Barbara finished two novels, Deaver’s The Sleeping Doll and Buried by Mark Billingham. 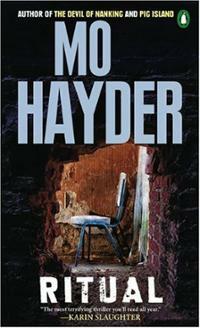 She’s now reading a novel by Mo Hayder, Ritual. Next up is another Mark Billingham, Death Message. Yes, she does like the dark stuff. 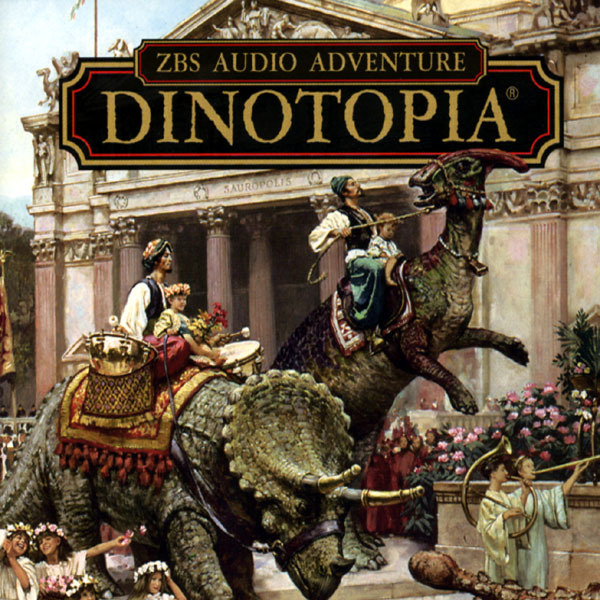 This entry was posted in Adventure, audiobook, Current Reading, mystery, short stories. Bookmark the permalink. I’m about to start reading a 1200-page book, SOME CAME RUNNING by James Jones. I have next week off so that’s what I’ll be doing. Until then, I’m reading short stories. I did order CONS, GRIFTS & SCAMS after reading your fine review. We may go to see the movie this week or next…or not. We’ve been going twice a week down here (so far, I liked BIRDMAN a lot) and renting other movies (BOYHOOD). I finished three books this week. The big one was the (ebook) RANDALL GARRETT MEGAPACK, which Amazon estimates was 858 pages. All that and I can’t say I loved it. I’m glad to be catching up with a lot of old sf stuff I missed but I preferred the book of Garrett’s stories co-written with Robert Silverberg. Will read the Lord Darcy book when I get home. The other short story collection I finished would probably be to your liking, the Crippen & Landru Lost Classics edition CHAIN OF WITNESSES: THE CASES OF MISS PHIPPS by Phyllis Bentley (edited by Marv Lachman). Miss Phipps starts out as your classic armchair detective. She is a crime writer herself and is able to help Insp. Tarrant solve a few crimes. In the later stories she travels around England (and in one story, to America), solving crimes wherever she goes, like a precursor of Jessica Fletcher. The stories were originally published between 1954and 1974 except fhr the first, which was published in 1937. I liked it. Finally, I read the second in Tanya Huff’s space Marines series about Staff Sgt. Torin Kerr, THE BETTER PART OF VALOR. Like you, I preferred the first in the series but I like this series and will get to the third when I get home. I read 20 short stories, all by Garrett and Bentley. Up next: a Stanley Ellin collection. I haven’t decided on which novel to read next. I read Joe Hill’s THE WRAITH, a graphic novel prequel to his novel NOS4R2. My FFB was LAVERNE AND SHIRLEY #3: GOLD RUSH, a television tie-in by Ron Goulart under one of his many pseudonyms — a slight but interesting book, especially for a Goulart fan (me). The latest Flavia de Luce novel by Alan Bradley, AS CHIMNEY SWEEPERS COME TO DUST, takes the twelve-year-old chemist/detective/would-be poisoner outside her comfort zone to a private school in Canada. Another engaging book in an engaging series. I also read THE SCIENCE FICTION OF MARK CLIFTON, a collection of some of the writer’s best stories. Clifton, who won the very first Hugo for best novel, is an under-rated and almost forgotten writer. Coming up are collections from Kris Neville, Lawrence Block, Seabury Quinn, Ray Bradbury, and Hugh B. Cave, Jack Snow, Joanna Russ, and James Tiptree, Jr. — enough to keep me busy for the next two weeks. Richard, I’m re-reading some Perry Masons beginning with THE CASE OF THE VELVET CLAWS as part of my “first novels” challenge. Just finishing up a short story collection by Neal Asher called The Gabble and Other Stories. Starting the new Michael Moorcock The Whispering Storm today and The Beat Goes On-story collection by Ian Rankin. Tried a Brad Torgerson story and thought it poorly written. Too much other stuff to read. George, I haven’t read SOME CAME RUNNING, though of course I’ve heard of it. I hope you enjoy the Gores book. Charles, I’ll bet you’ll like the movie. You get movies from the library? The selection here is small, but I haven’t looked much. Jeff, I’ll be interested to hear your opinion of the movie. I wouldn’t have expected you to like all of the Garrett, there’s so much in that set, but there must have been a good number to enjoy. I doubt most people read the thing straight through! I like the Darcy books. I stopped getting the C&L books last year, but have all the older collections. While I read 3 stories you read 20. Typical. Jerry, I still haven’t figured out what the title NOS4R2 is supposed to mean. I also haven’t read any of the Flavia de Luce novels. This reading is a thing one never catches up to. I remember reading THEY’D RATHER BE RIGHT in Astounding in the late 1950s (it was serialized in 1954 but I read it later). I really liked it. That’s quite a list of upcoming books! You fast readers sure get through a lot. Prashant, that first Mason novel is a lot more hard-bolied than the later ones, and Mason himself is a tougher, rougher character. After about five books the books smooth out and become more like the crime and courtroom dramas most readers are used to. Steve, I read a couple of reviews of The Gabble but don’t remember if they were good. I’m not very impressed with Torgerson either, but I’m trying to finish up the collection, with only a few stories left to read. It’s not a keeper and I won’t be buying any more of his stuff. I’m reading – just started – another SF book, Fluency. It’s not very well written either. It’s the author’s first novel, and though I heard good things about it, I so far don’t know why. Tired, cliched plotting, cardboard characters. On page 20 I can already see where it’s going, I think. If it was better written I’d hang on, but it’s one I doubt I’ll finish. Ah, so horror. Thanks Steve. If that C & L book sounds interesting to you let me know and I’ll send it to you when I get home. I am not going to ever read it again. I know you are swamped with books. Jeff, that’s very generous of you, my friend, sure, it sounds like one I’d enjoy. Thanks! Just finished a Henning Mankell, who has come to be a favorite writer thanks to the TV series and just started a Peter Robinson. I always enjoy Banks. Also reading BOYS IN THE BOAT for my book club, which I am finding tough going. Maybe I should get the print book rather than the kindle because I can’t keep the characters straight. Phil had read like eight books to my four here. But I have been doing copy edits and page proofs so my eyes are dead. What has been fun is taking documentaries out of the Atheneum Library here. Learning a lot about artists especially. TV shows are on at odd times for our schedule and DISH TV is awful sometimes half the stations are missing. Patti, I haven’t read any Mankell, but perhaps I should. I now have that Peter Robinson book sitting at the library. I never got very far into the series, though I liked the first couple I read. I’m looking forward to reading it after I finish the SF novel I’m halfway through now. I’ll probably get an iPad in the next month or so. Barbara is in favor of it, and it would be a fun toy, but I don’t have a lot of use for it other than ebooks and possibly email. I wouldn’t use it as a phone, I have an iPhone I rarely use. You’re in your vacation place, the weather is nice and you get out more, you’re doing editing, and the roof fell. I’m not surprised you’re reading less. I’ve never had a satellite TV setup, so I don’t know how they work, but I’m sure it’s about which package the condo owners buy. I feel the same way about TV schedules, especially sports, when I travel east. For NFL games, the first game is at 10, not at 1, which is when the second game starts. On the east coast, the Grammies the other night would have ended at 2:40! It was late enough here. We’re getting more and more things from the library these days. We always look there first, then BookSwap, before we consider buying anything. I read the first Mankell – Faceless Killers – and his collection of longish Wallender stories, but of all the Scandinavians he is not the one I will be going back to any time soon. I prefer Jo Nesbo, for instance. I’ve heard a lot of bad stuff about Dish TV. We had Time Warner for over 20 years from the first time they wired our area but, as you know, we recently switched to Verzion FIOS. So far we could not be happier. If there is a problem, which there is infrequently, we’ve been able to resolve it using the on-screen help without even having to call them. We’re getting used to the different channel numbering system. We LOVE the new expanded DVR, too. Down here we are at the whim of what Marriott provides. That includes a lot of ESPN channels, two HBOs, most of the “regular” cable channels we watch at home (USA, TNT, FX, SyFy). The big thing is how dependent we’ve become on the pause, rewind and start over features that we don’t have here. I can’t record something and watch something else, or skip the commercials. And it annoys me that when you turn the television on, it is always set to Fox News. Funny, Jeff, I’d had the impression all this time that you rented a condo when in Florida, not stayed at a hotel. No, we keep telling Patti the hotel is the way to go. To get an apartment here they want a three month rental which is too long. The hotel actually costs us less than a condo would plus we get the perks we want.